Cleaned "prototype - Release gcc"
g++.exe -Wall -pipe -mthreads -Wno-attributes -D__GNUWIN32__ -D__WXMSW__ -DwxUSE_UNICODE   -D_UNICODE -D__WXMSW__   -IC:\wxWidgets-2.9.4\include -IC:\wxWidgets-2.9.4\contrib\include -IC:\sqlite-amalgamation-3071602 -IC:\wxWidgets-2.9.4\lib\gcc_lib\mswu -IC:\wxsqlite3-3.0.3\include -IC:\wxWidgets-2.9.4\include -IC:\wxWidgets-2.9.4\lib\gcc_lib\mswu  -c C:\Users\ma\Documents\projects\prototype\prototypeApp.cpp -o "obj\Release gcc\prototypeApp.o"
g++.exe -Wall -pipe -mthreads -Wno-attributes -D__GNUWIN32__ -D__WXMSW__ -DwxUSE_UNICODE   -D_UNICODE -D__WXMSW__   -IC:\wxWidgets-2.9.4\include -IC:\wxWidgets-2.9.4\contrib\include -IC:\sqlite-amalgamation-3071602 -IC:\wxWidgets-2.9.4\lib\gcc_lib\mswu -IC:\wxsqlite3-3.0.3\include -IC:\wxWidgets-2.9.4\include -IC:\wxWidgets-2.9.4\lib\gcc_lib\mswu  -c C:\Users\ma\Documents\projects\prototype\prototypeMain.cpp -o "obj\Release gcc\prototypeMain.o"
windres.exe -IC:\wxWidgets-2.9.4\include -IC:\wxWidgets-2.9.4\lib\gcc_lib\mswu -IC:\wxWidgets-2.9.4\include  -J rc -O coff -i C:\Users\ma\DOCUME~1\projects\PROTOT~1\resource.rc -o "obj\Release gcc\resource.res"
The strange thing is, using similar settings and code with vc10 compiler, it can finish the compile and generate exe file. And both compiler (tdm-gcc and vc10 both 64bit) can compile and link the wxsqlite3 lib with its sample and the sample gives same output, I believe. wxSQLite3 depends on SQLite - therefore the wxSQLite3 library has to be placed before the SQLite library, because otherwise the GCC linker won't be able to resolve the unresolved symbols from wxSQLite3. The VC++ linker works differently: it always searches all given link libraries, and is therefore less dependent on the order of the link libraries. 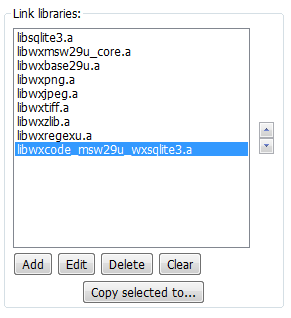 Moving libwxcode_msw29u_wxsqlite3.a to the top of the list should solve the linker issue. Thank you Ulrich, your are definitely right. This solved my problem.